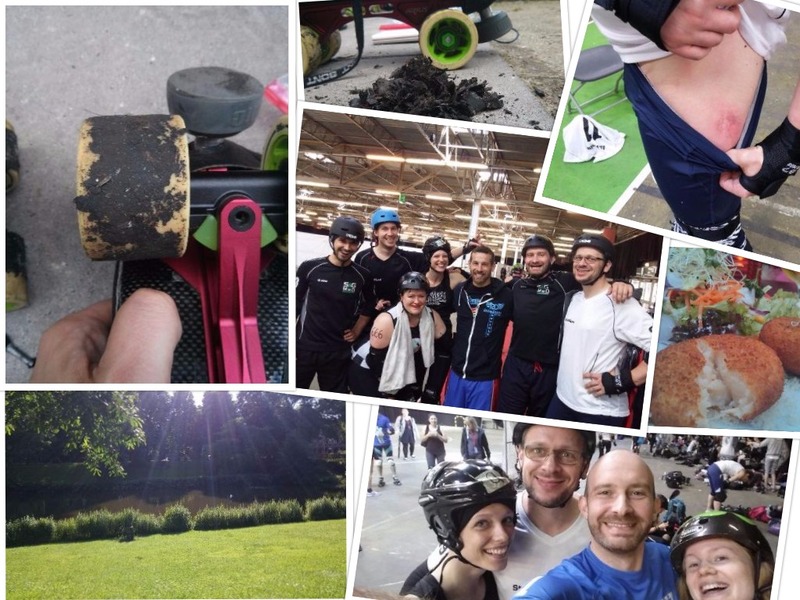 Last weekend, five of the SGMRD players packed their bags to train and play some derby. Our “Mahatma Bronson #3” spent his time in Milano, Italy at the “SKIR 2016”, the four of “Duke Jukem #23, Jam Pain #11, Lukomotive #17 and Steißkerl #999 took the long road to Bruges, Belgium to participate at the amazing Derby Revolution 2016. We spent 4 days packed with skating classes, derby strategy, scrimmages and theory classes to widen our view and sharpen our edges. High class international coaches (full list here) filled their training sessions with inspiring, challenging and sweaty drills. The vast number and variety of offered classes gave each of us the opportunity to satisfy his own interests, be it as a skater or coach, on a technical or strategic level or by spending time with nice people from all across Roller Derby Europe. We’d like to thank all coaches for their input and working all 4 days constantly to help improve European Roller derby. Thank you Missy Rascal for showing us edges that we never knew existed. Thank you Christy Demons for giving us watery eyes admiring your quick feet. Thank you Mick Swagger for bringing us the latest strategies and the coolest session names. Thank you Laci Knight for giving us insight in fitness aspects and for your first ramp drop-in with Lukomotive. Thank you Shaina Serelson for reminding us, that forward blocking still exists and is tremendously powerful. Thank you Tony Muse for your energetic training sessions, “douchebag moves” and for emphasising that backwards blocking is an awesome tool, but not if it is your only tool. And Thank you to all other coaches, supporters and helping hands. Finally, a big shout-out to what seemed to be half of the German Derby community we were able to meet (again).